The world of Middle Earth that was created by J.R.R. Tolkien began in 1937 as a fantasy novel called The Hobbit. It's popularity eventually developed into the much larger work in the Lord of the Rings series. It was pretty much a guaranteed that filmmakers would eventually bring the stories of the Shire and the One Ring of Power to the big screen especially utilizing the advances in CGI. Peter Jackson's live action adaptations began with the trilogy in 2001 before the sequel to those stories began in 2012. The small book was stretched out to three films and have pretty much ended our journey with the hobbits, elves, wizards, orcs and men of Tolkien's beloved world. The last of the series was once again directed by Peter Jackson who also wrote the screenplay with Fran Walsh, Philippa Boyens, and Guillermo del Toro. After last year's The Desolation of Smaug, the dragon, Smaug the Magnificent (Benedict Cumberbatch) is now laying waste to the Laketown for associating with the Dwarfs that want Lonely Mountain. 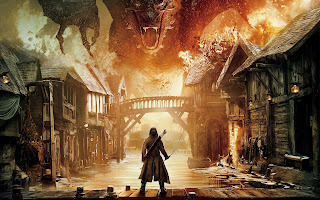 Bard the Bowman (Luke Evans) having broke out of prison during the destruction is aided by his son Bain (Ken Stott) in killing the the gold crazed dragon. The townspeople look to Bard as their leader with the encouragement of the former leader's lackey Alfrid (Ryan Gage). They decide to move to Dale near Lonely Mountain to hopefully get the reward promised by the Dwarf King Thorin. But he's also being driven mad from gold fever and blockades the entrance to Erebor. Meanwhile Galadreil (Cate Blanchett) frees Gandalf (Ian McKellen) from Dol Guldur. Elrond (Hugo Weaving) and Saruman (Christopher Lee) help her battle the Nazgûl. They know they must warn the Free people of the evil Sauron's return. (The events after this is the beginning of the Lord of the Rings series). Gandalf comes to Erebor to warn Thorin that many armies will be headed towards the Lonely Mountain now that the dragon is dead and the mountain cave is filled with gold. The first of them is the Elf troops lead by Thranduil (Lee Pace) who wants the Arkenstone. Bilbo (Martin Freeman) who is concerned by the change in King Thorin and his obsession with the Arkenstone along with the gold, bring the precious stone to Thrandruil and Bard so they may use it to barter with the Dwarf King. Just then Thorin's cousin shows up with Dwarf reinforcements to fight the Elves, but just as suddenly they must unite to fight the Orcs that are bearing down on the town of Dale and the Lonely Mountain. Legolas (Orlando Bloom) and Tauriel (Evangeline Lilly) are also on hand to help fight Orcs. There is also a tease on a back story for Legolas who doesn't want to return to his father. Maybe they will do some character based stories of the denizens of Middle earth to keep the franchise alive. Unless you are familiar with the books, or just did a marathon with the other movies, it's hard to tell who is who and why. The Dwarfs with their hairy faces look pretty much alike. Only the romance with Kili (Aidan Turner) and Tauriel the Elf stands out. The rest of the movie is grand battle sequence with the various armies. They eventually lead little moments that foretell omens of what would soon lead to the Fellowship of the Rings. It's not a bad idea to pop those in the DVD player when you get back from the movie. The performances are to be expected, and the music is filled with those Middle Earth refrains. It's nice, somewhat forgettable and a forlorn relief that it's all over.